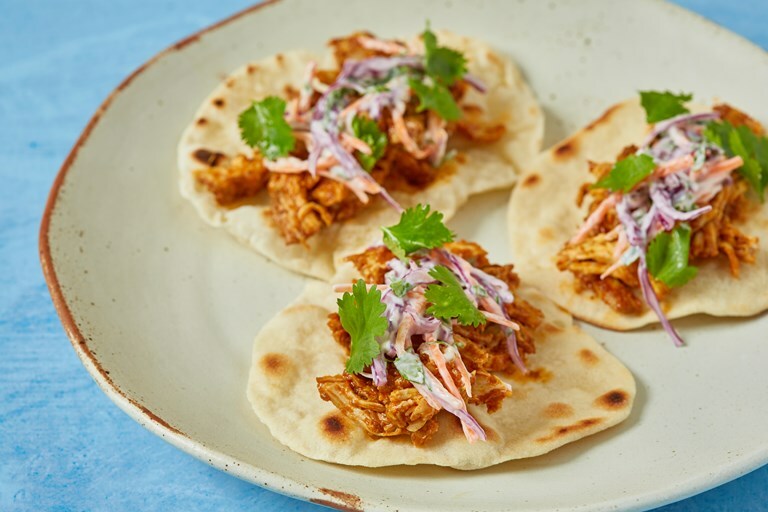 These 'tacos' are in fact mini Indian flatbreads – the perfect vehicle for Anjum Anand's spicy pulled chicken and crisp Indian slaw. A quick and simple dish that works perfectly as a midweek meal, or as a sharing dish for a get-together with friends. These are delicious mini "tacos" to share with friends, or can be whipped up as a delicious 30 minute midweek meal. If you are vegetarian, try making these with 250g of Quorn chunks or other vegetarian protein, which you can cook in the sauce on the hob until well-coated, for around 8–9 minutes. The added sugar gives you that sweet, spicy pulled barbecue flavour but is not mandatory, the sauce itself is delicious as it is! Anjum Anand grew up in London but has also lived and studied in Geneva, Paris and Madrid.